This is the heart of the Autism Cares Foundation, an organization that raises funds for kids with autism to improve their life experiences. The foundation’s focus is giving kids with autism the opportunity to participate in various activities. One way Autism Cares Foundation is pursuing this goal is by joining with 95.7 BEN-FM to host a Special Needs Night on August 1. 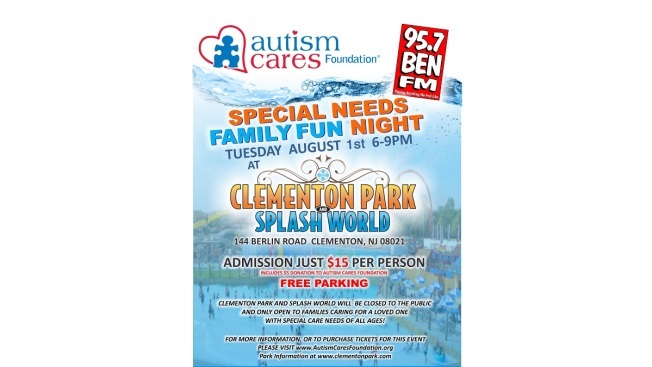 The duo will be closing off Clementon Park & Splash World so the park is open to just families with loved ones who have special care needs. The event will last from 6 p.m. to 9 p.m.
Tickets, which include admission to both the theme and water park as well as parking, are $15. Five dollars of each purchased ticket will be donated to the Autism Cares Foundation. The event is the group’s 2nd annual Special Needs Night. To buy your tickets, go to the Autism Cares Foundation website.